I’m in LOVE with this gallery wall idea! I know painted frames on a wall is not really a new idea, but this version looks particularly pretty to me. If it was warm enough outside to spray paint today, I’d be finding some coral paint and recreating this right now. Maybe I’ve been bit by the Spring Decorating bug, because I’m loving this fresh springy color scheme too. But I’ve always loved coral, it is one of my favorite colors! I usually like gallery walls, but sometimes they get a bit out of control and cluttered for my personal taste. So this unified and classy but whimsical version from Tobi Fairley is right up my alley. I like how she doubles up a couple of the larger frames with a smaller frame inside too. I really love how she put shells on the wall in the frames (or at least that is what it looks like to me!) to complete the fun coastal vibe here. Simple, affordable, quirky, fun, stylish and cheerful … and easy to recreate! So many words to describe how much I love this. Kids’ bathroom update: We are still filling nail holes, caulking seams and painting walls….why oh why does it take us eight times as long as the average blogger to finish a room? Sigh. Hey, have you been hanging out with me on Facebook? If not, you have probably missed a sneak peek or two of some of the projects I’m working on, before they make it over here to the blog. I have a few more sneak peeks to show you this week!!! Ok good…lol! I really do feel slow! But I sure enjoy it when others do! Hope you are having a great week, sweet thing! Love the color she used! I’ve been craving some springy colors to counteract all these drab, dreary days we’ve had most of the winter, so a couple of weeks ago I began painting some whimsical watercolors and have really enjoyed doing them! Do you know what fabric that is? LOVE IT! Too cute! I don’t like the cluttered look of most gallery walls, but that’s adorable! I have the spring bug, too! I used the gift card I won here (yay!) and bought some super-cute spring-y curtain panels from World Market (on sale – 17 each!) and some fresh toss pillows from Target! I’m still staring at my mantel and trying to figure out what I want to do with it, but I’m thinking my collection of muted, soft-colored eggs is about to make an appearance…I love spring! 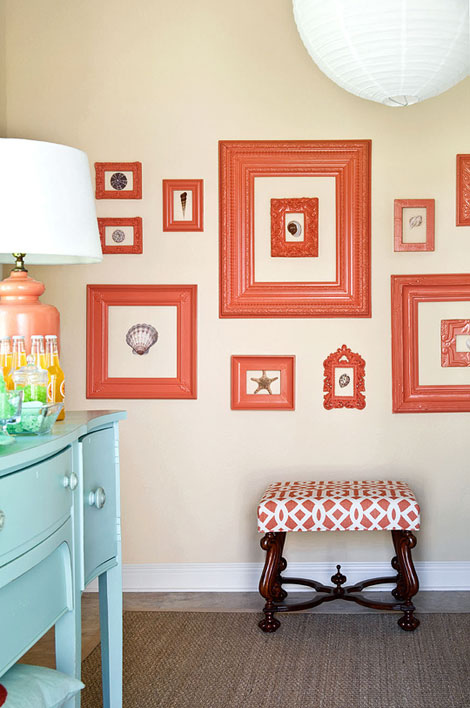 I think you’re right about the fresh coral color–it unifies them and also makes them a focal point as a grouping. Oh yes, I’m definitely in Spring Decorating mode! Or maybe it’s Spring Makeover mode … I don’t know, but I’m definitely ready for change! Coral & turqouise are my all time fav colors.. they actually were my wedding colors this summer in Hawaii. I love love this gallery wall. I have been wanting to create a gallery wall in my staircase but for some reason I keep putting it off and appreciating the plain walls more..
Yeah, I’m definately itching to “lighten” my home! 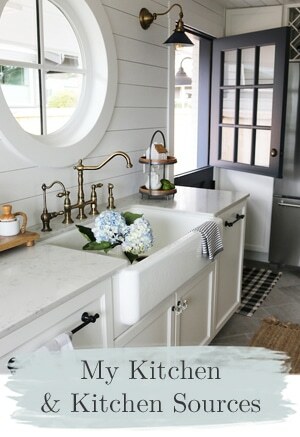 I’m finding I really want a whiter, lighter decor and trying to find a way to get that done! What a pretty colour! Coral is one of my favourites to wear. 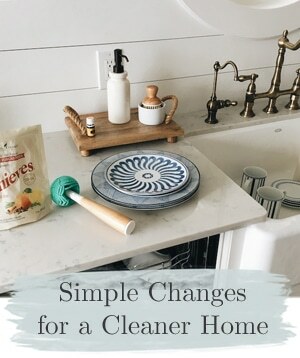 I don’t think you are taking longer than other bloggers to get your bathroom makeover done. What I think, is that people don’t post about their projects until they’re already almost done. At least that’s what I tell my self to relieve the pressure to finish. Great idea! Loving the frames love the coral color and the shells keep it from feeling too cluttered. I think that tiny curlique frame at the bottom really makes it all, sweet. Can’t wait to see what you end up doing! I’m going to do a little digging around myself and see what I’ve got frame wise. I hadn’t been bitten by the bug till I read this post! Now where did I hide, ahem, store, all those empty frames….? I had other plans today, but it’s a sunny spray paintin’ kinda day! Oh Yes, the spring decorating bug for sure… I spent Saturday doing a porch makeover:) I also made a spring yarn wreath that makes my heart sing when I pull in the driveway! Cool idea!! How do you plan to attach the shells to the wall?? What is it about this time of year? I am raring to go on several projects and I figure I better strike when the energy and “irons” are hot! I’ll be anxious to see your gallery once you’ve completed it. Especially lovin the corral and turquoise. Definitely feeling the decorating-spring fever bug!! Picking out trim and paint colors!! I’ve totally got the spring fever! But the only thing I have done is put out a few birdies and some potted hyacynths on the table. I plan to add more this week! we are on the same page..i posted about coral yesterday..yummy! I love coral and navy! a gorgeous combo! The color combo is killer! But here’s what I love about this wall besides the bright color and three dimensionality of the painted frames: you can always change the paint color should you tire of coral. That flexibility to tweak and re-envision is key. 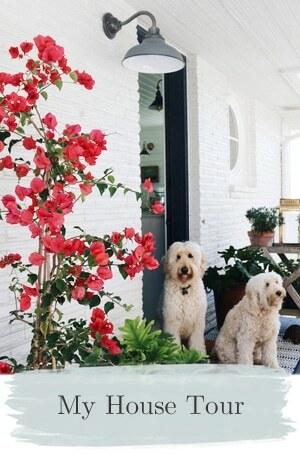 Love, love, love it– now I need to go get my spring decorating on! I love the coral colored frames. I’m working on a gallery type of wall. Hopefully mine will look that good! I just love the “coral gallery” and the shellsa are just perfect touch. Coral always been a very popular color here in Florida- to wear and decorate with. I am SO with you on the spring decorating! I am itching to bring more color into my house, but trying to take it slow and not go overboard! That coral wall gallery just sings against that turquoise wall! ThankYouThankYouThankYouThankYouThankYouThankYouThankYouThankYouThankYouThankYouThankYouThankYouThankYouThankYouThankYouThankYouThankYouThankYouThankYouThankYouThankYouThankYouThankYouThankYouThankYouThankYouThankYouThankYouThankYouThankYouThankYouThankYouThankYouThankYouThankYouThankYouThankYouThankYou for using “peek” instead of “peak”! The bug has hit here too! I need to buy paint this week! Time to refresh some rooms, ready for spring and summer! 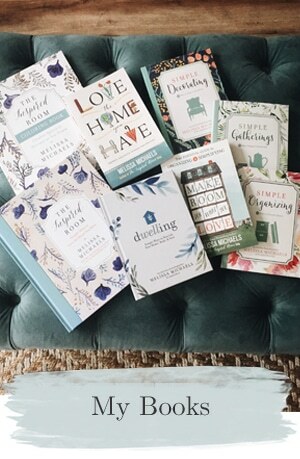 Wow, this post just made the spring decorating bug bite me right in the booty, to make me get off mine and go create something. I’m gone, after I type this, just gave me the idea of what I need to put over my shelf, which will go over my coffee bar, I have a ton of old frames, and I’m thinking some sort of coffee cup/pots theme will go in the center of my frames. (How’d you like that run on sentence???) (That happens when I get excited.) Thanks for sharing this, THANK YOU! I’m inspired! Isn’t that what your blog is for? 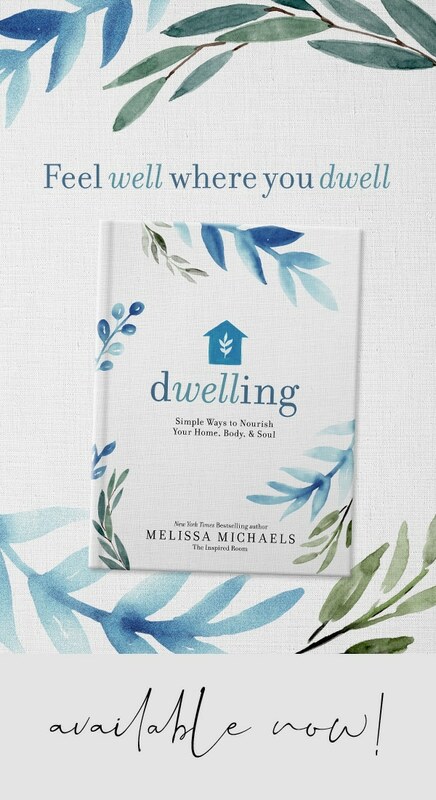 Thank you Melissa dear! The thing I like about it is that, although the frames are really the feature, they aren’t the *only* thing on the wall. After the “POW” of that gorgeous coral, there’s the delight of those sweet shells. Truly inspired. I love the look of the tangerine with the aqua blue. Nice. LOVE LOVE LOVE!! My husband, being an artist, has a series of 8×10″ originals. I have found several frames (gold, brown, multi tone) all of different widths to frame and hang the together. It looks excellent. Framed originals in a series, there NOTHING like it! What a cute idea and a great way to add some punch to dull wall! I don’t know if I’m itching for spring colorwise so much as I can’t wait to spray paint again! I mean, how much longer can this winter last? 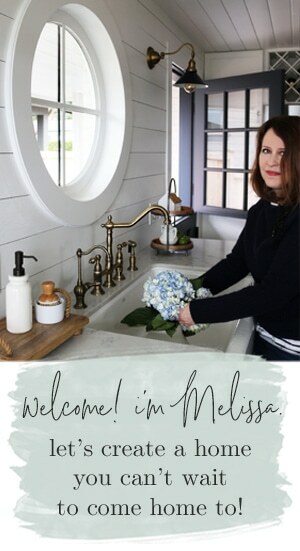 Hi, I follow your blog & you do the most wonderful things & really inspired me! I feel completely stupid but… I got a very cheap, no brand name sewing machine from E Bay, it worked great, I tried to change the bobbin (drop in on top next to the needle, kind, simple, automatic! )& I just can’t get it to work! I have no instructions! This is so frustrating. Can anyone help me. I know this is stupid. I’ve never done any thing like this before & I don’t come from a crafty family. I’m an English woman living in Texas & I dont know very many people. This is so basic & you are all so creative. Please help! Suzanne. Hi Suzanne! Don’t know if anybody’s reached out to u privately,but I dont see an answer here, so will try to help. I’ve been sewing since I was 11 (and still have the Kenmore momma gave me for my bday,plus 2more&a serger I havent gotten out of the box since daddy found out he had bladder ca 10.5yrs ago,eek). Have a bunch of questions since I cant see the machine,but am guessing it has to do with how u drop the bobbin&which direction the thread is supposed to go. It could even be an issue of bobbin tension. 1st-have you tried youtube for how-to vids? 2nd-any fabric shops that also sell machines&do classes? Just because it’s an off-name doesn’t mean a thing–SOMEBODY will be able to help you, I promise. Or even look up “sewing machine repair-all makes” in the YellowPages–those guys know *everything* from my experience!And u can take it to the shop or have them come to your home (look for BetterBizBureau,insured&bonded etc). I am”V Susan Evin”on FB,or Melissa wud u give S my email please?Have idea,no rm left! Do I have the spring decorating bug? Nope, not me, hmmhmm. I just happen to love whites, blues, greens, little birds, floral prints, sunlight through the windows, sparkly stuff. Okay, the hubby is at work and I’m among friends, right? YES I HAVE IT!!!! I want to paint the living room, the kitchen. I want new drapes, and I would love new carpet, and I’m soooo tired of the fall trees print hanging above my fireplace, and I’m thinking about recovering the dining room chairs, and somebody stop me!!! I think I just got bit by the bug! I just came home with two new mirrors that I immediately hung, a bulletin board, picture frames, and decor for my office-and I was really holding back as to not buy out the stores! Is this really something that happens every year at this time? I love this picture frame idea. The whimsical color and the types of frames used really make it unique and fun. I might try something like this for a blank wall in my hall. Ooh I love this!! I’ve seen this done w/ black frames before, but I really like the colored frames. It definitely warms up the room.